Garmat® USA’s mission is to provide innovative and cutting edge technologically advanced refinishing equipment that enhances your facility’s productivity and profitability. 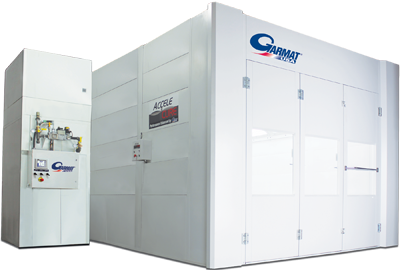 Garmat USA manufactures paint booths and finishing solutions for collision repair, aerospace and industrial applications. Founded in 1988 and manufactured at our corporate headquarters in Englewood Colorado, Garmat USA strives to provide the most technologically advanced paint booths and refinishing equipment, that not only enhances production but provides an environmentally safe atmosphere for the technician and community. Since its inception, Garmat USA has introduced technologies that have revolutionized the refinishing industry. Garmat’s growth is directly attributed to their commitment to innovation and quality. With patents on Accele-cure® air accelerator system and the integrated mechanicals found in their Modified Downdraft Models such as Tier 1, Frontier and Chinook. Garmat USA manufactures high quality equipment with production enhancing attributes, energy efficiencies and environmental friendly features.